Bridgeport Mayor Joseph P. Ganim flanked by supporters outside the state Capitol on Monday. Connecticut’s Democratic gubernatorial contenders took aim at President Donald Trump’s administration Monday, vowing to push back against attacks on abortion access rights and environmental standards. 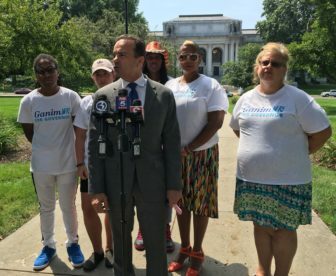 Bridgeport Mayor Joe Ganim called for an amendment to the Connecticut Constitution to reinforce a longstanding statue legalizing women’s right to an abortion. His rival for the Democratic nomination, Greenwich businessman Ned Lamont, offered a multi-pronged strategy to resist what he called the steady weakening of environmental standards by the Trump administration, adding they pose a threat to Connecticut’s physical and economic health. Ganim echoed other state politicians and abortion-rights advocates nationwide who are calling for further reproductive rights protections amid Trump’s pivotal new Supreme Court nomination of Brett Kavanaugh. The Bridgeport mayor said incorporating the current state statute into the state constitution would combat the the passage of federal laws or the Supreme Court’s potential overturning of the landmark Roe v. Wade decision, which legalized abortion. Ganim’s announcement comes two days before House Majority Leader Matt Ritter, D-Hartford, hosts a roundtable discussion on Wednesday with abortion-rights advocates to discuss the landscape of Connecticut’s reproductive rights. Nine other states have added abortion protections to their constitution—Alaska, California, Florida, Iowa, Massachusetts, Minnesota, Montana, New Jersey, and New Mexico, according to the Center for Reproductive Rights. In Connecticut, enshrining a woman’s right to terminate a pregnancy would require 75 percent of the members in both the state House and Senate to approve a proposal to put it before voters in the following election. Lawmakers could still send the measure to the ballot box without meeting that threshold if a simple majority approves it during two successive legislative terms. For example, if the 2018-19 legislature approved the proposed amendment by a simple majority in both chambers, the matter would have to come back in the next legislative term, which begins in 2020. If adopted a second time, even by a simple majority, it would be placed on the next state ballot. Ganim said pursuing the measure would be worth the effort despite a potential years-long battle. The candidate also called for the state to preserve access and funding to affordable health care, citing the need to fight federal gag orders on women’s health clinics. That rule bars federal family planning funding for organizations that provide abortions or make referrals. Democratic gubernatorial candidate Ned Lamont (left) and state Attorney General George Jepsen talk with reporters at Great River Park in East Hartford. 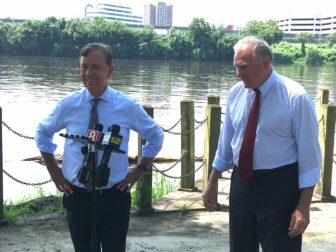 Meanwhile, Lamont said during an early afternoon press conference along the Connecticut River in East Hartford that the environmental stakes for Connecticut are huge given the Trump agenda. Since taking office in January 2017, Trump proposed overturning, weakening or reducing funding for 26 Obama-era regulations, fuel-efficiency standards and other policies to stem climate change and otherwise limit pollution. Further complicating matters, Lamont said, is that the Trump changes are not necessary. Major corporations “know what the (environmental) rules are and have invested accordingly,” he said. Nationally the changes would cause more than $450 billion in economic damage over the period, Jepsen said, primarily through increased consumer spending on motor fuels. Jepsen’s office has been working with a multi-state coalition and preparing testimony to the U.S. Environmental Protection Agency to oppose many of the changes Trump is seeking. And Jepsen, who is not seeking re-election this fall, said Connecticut’s next governor and attorney general may have to go to court in the coming months to oppose many of the Trump policies. Lamont said he would support that action. “We must make sure we hold the president’s feet to the fire,” he said. Lamont also said he would support state incentives to encourage greater consumer use of electric cars and other high-fuel-efficiency vehicles. “Public transportation also has got to be a key priority for us,” he said, adding that means more frequent and regular rail and bus transit service.